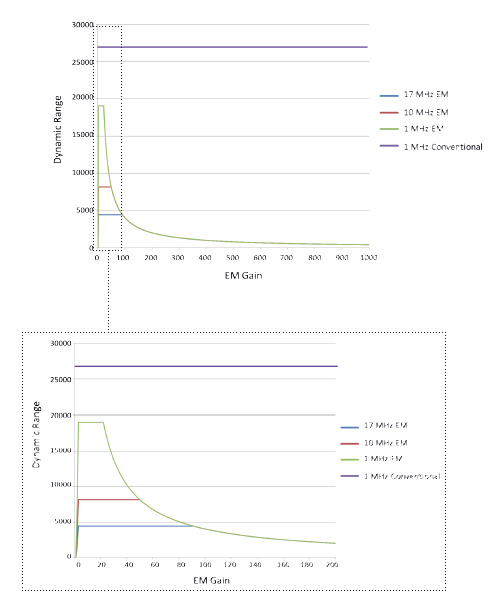 Figure 1 - Dynamic Range vs EMCCD gain, for iXon Ultra 897. Shown for EM amplifier @ 17, 10 and 1 MHz readout speed and for Conventional amplifier at 1 MHz readout speed. Well capacities used in DR calculation are characteristic of the CCD97 512 x 512 back-illuminated L3 sensor from E2V. Dynamic range only exceeds 14-bits max @ 1 MHz, through either amplifier. Calculating dynamic range in EMCCDs has often been a source of confusion, due to the additional requirement to factor in EM gain and the extended well capacity of the gain register. High dynamic range can be accessed in EMCCDs with careful fine tuning of EM gain. The main function of EMCCD is to eliminate the read noise detection limit and enable detection of weak photon signals that would otherwise be lost within this noise floor. With EM gain, the detection limit is given by the 'Effective Read Noise', i.e. the read noise divided by the gain multiplication, down to one electron. Why never less than one? This stems from the definition of detection limit, which is essentially "the signal equal to the lowest noise level". Since you can't get a signal less than one photon, then the detection limit should never be taken as less than one electron. For example, the iXon Ultra 888 has a read noise of ~45 electrons @10 MHz with EM gain off. At EM gain x2, the new detection limit can be considered to be 22.5 electrons effective read noise, at x5 it will be 9 electrons, at x45 it will be 1 electron. At x100, the Effective Read Noise will be 0.45 electrons, but as far as the dynamic range calculation is concerned, this detection limit must still be treated as 1 electron. One might imagine that applying EM gain will decrease the full well pixel capacity proportionally. This is indeed the case, but a buffer has been built into EMCCD cameras to enable at least some EM gain to be applied while maintaining the original well capacity. This buffer is in the form of a higher capacity in the gain register pixels, where the multiplication actually takes place. So, the true capacity is given by the capacity of the pixels of the sensor, but as you apply EM gain this holds only up until the point where the larger capacity of the gain register pixels also become saturated by applied EM gain. After that point, you have to correct the 'effective' full well of the sensor to be equal to the full well of the gain register divided by the gain. These above factors combined mean that as EM gain is increased, Dynamic Range will increase with gain to a maximum, level off and then reach a point at which it begins to deplete again with further gain. iXon Ultra 888 back-illuminated EMCCD can be read out at either 30, 20, 10 or 1 MHz speeds. This offers extended flexibility to balance Dynamic Range vs. frame rates. Furthermore OptAcquire can be used to select optimal Dynamic Range settings at fastest and slowest speeds. This can seem complicated, but fortunately these DR vs EM gain relationships can be readily plotted out and visualized in graphical form, as exemplified in Figure 1. The rationale behind offering readout speeds slower than 17 MHz through the EM-amplifier is so that frame rate can be traded off against dynamic range. You can see that the highest dynamic range through an EM amplifier comes from the slowest 1 MHz readout speed. At any readout speed through the EM-amplifier, the best combination of Dynamic Range and sensitivity can be obtained at an EM gain setting equal to the readout noise at that speed. At this point the DR is at maximum and the effective readout noise is 1 electron (i.e. just on the verge of single photon sensitivity). At x1000 EM gain the dynamic range is only 400:1. Excessively high EM gain can also accelerate EM gain ageing in back-illuminated EMCCDs (see section 7). EM gains of x300 or less are more than sufficient to optimize sensitivity, while ensuring dynamic range is not excessively compromised. The only occasions when Andor recommends extending EM gain to x1000 is for single photon counting experiments. The highest dynamic range is through the conventional CCD amplifier. It is clear that the actual sensor Dynamic Range only exceeds 14-bits at 1 MHz, through either EM or a conventional amplifier. Therefore, it is at 1 MHz that it becomes important to match this higher dynamic range output with a scientific grade, noise free 16-bit A/D digitization. Note: There is a direct relationship between readout noise and maximum dynamic range at a given readout speed. Lower readout noise affords higher dynamic range. The readout noise specification used in calculating dynamic range must be with EM gain turned off, as quoted in all iXon spec sheets. We note, however, that another prominent EMCCD provider chooses to quote their lowest read noise value, not for EM gain-off, but only for EM gain x4, x6 or x10 (model dependent). In this case, to arrive at the real read noise spec you would have to multiply the quoted figure by x4, x6 or x10.